Product prices and availability are accurate as of 2019-04-11 16:43:14 UTC and are subject to change. Any price and availability information displayed on http://www.amazon.com/ at the time of purchase will apply to the purchase of this product. Usage: A two pound brick can make between 8 - 10 soaps, depending on the size of the soap you're trying to make. Description: Our Clear Melt & Pour Glycerin Soap Base sets a new standard for "standard" glycerin soap base. It is crystal clear with no odor and is made from ORGANIC VEGETABLE OIL ingredients and contains no alcohol or harmful products to dry your skin. We buy our product from organic certified supplier, made with organic ingredients. Common Uses: Glycerin is a natural emollient, draws moisture out of the air to benefit skin health. It cleanses without stripping or upsetting the delicate natural pH balance necessary for soft, healthy skin. And since we don't use animal oils, our soap rinses clean and leaves no soapy film behind. All our soap bases are produced from the highest quality double distilled and deodorized coconut oil, forming luxurious lather and sparkling clarity. The clear soap base offers a crystal clear bar of soap and is great for using with inserts. You can use sprigs of natural herbs, like lavender, small toys for specialty kids' soaps, or any other insert you like. 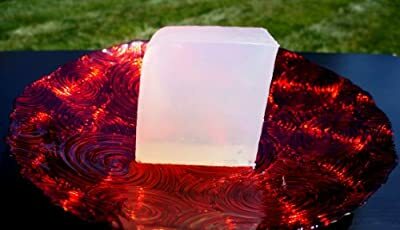 The soap base is also great for making aromatherapy soaps; since the soap base has been deodorized, the wonderful smell of your favorite essential oils can be added to the bar. Also, deodorizing the glycerin allows you to use less essential oil, saving time and money. Caution: We would recommend fully wrapping the entire soap bar as soon as it is poured and cooled - this should minimize /eliminate any shrinkage. All of our soap products are for external use only. Look forward to do business with you, H&B OILS CENTER Co.